Owning and caring for rabbits can be great fun and very rewarding, but it’s a big responsibility and a long-term commitment in terms of care and cost. Rabbits are a popular favourite pet for children, but it is important to remember that they typically live for 8-12 years. So you need to be in it for the long haul! After all everyone wants their pet to live a long and healthy life, so whether you’ve had a rabbit for years or you’re just contemplating getting one it is important to know some rabbit care basics in order to create a safe, loving environment for the furriest member of your family. From diet and housing to bunny proofing and grooming learn some tips for helping your rabbit to live the long and happy life that they deserve. The bigger house the better! When it comes to choosing housing for your rabbit, bigger is always better! But as a guide a rabbit cage or hutch should be high enough for your rabbits to stand on their back legs, stretch out fully, and with enough floor area to allow a minimum of three to four hops in any direction. Plus if you are going to house multiple rabbits you will need to get a bigger hutch. As each rabbit should be able to have separate eating and toileting areas. If you have more than one rabbit, there should also be somewhere for them to be alone from each other – after all we all need our own space sometimes! Rabbits can happily live both indoors and outdoors. If you decide to house your rabbit indoors there are several ways that your rabbit can live inside with your family. They can live free-reign in a bunny proofed room or rooms, they can be contained within a puppy pen, or be housed in a large rabbit cage. Although no matter how they are contained, their space should always be large enough so they can hop around, and they should be let out of their pen for at least a few hours everyday to stretch their legs and get some exercise. If you decide to have a ‘house rabbit’ (a rabbit with free-reign of your home) extra care must be taken to keep them safe in their indoor environment. We like to call this ‘bunny proofing’ All cables must have a protective covering, and house plants should be removed as they may be poisonous. Just like cats, rabbits can easily learn to use a litter box. To litter train your rabbit first place a litter box in the cage, then start to place the rabbit droppings into the tray over a period of a few days. Put the litter tray in the areas that they usually toilet which tends to be in a corners. Then fill the tray with bedding or litter made of paper or wood chips. If you have a house rabbit it is important to use multiple litter trays throughout the house to ensure that you offer options for your rabbit so they are more likely to use them. For an outdoor rabbit a hutch with a run permanently attached makes the perfect home. To think about it in human terms, the hutch itself is really only the rabbits bedroom, so they should always have access to a run at all times so they can choose to be inside or outside as they wish. When housing a rabbit outdoors you need to think carefully about where you position the hutch should always be dry, well-ventilated and kept cool. Extreme heat can be fatal to rabbits, so it is important to keep them out of direct sunlight. But you also need to consider their comfort in the colder winter months. To help keep them warm it is recommended to add extra bedding to an outdoor hutch and move it into a garage. Contrary to popular belief a rabbit needs a lot more than just grass and carrots to stay healthy. Rabbits have complex digestive systems, so it’s very important that they receive a proper diet. Unfortunately many common ailments seen in rabbits are caused by poor diet or feeding foods that are not compatible with their digestive system. Rabbits, guinea pigs and chinchillas are all herbivores. But by far the most important element of their diet, the one thing they absolutely must have to stay healthy and happy, is fibre, so they have taken on the title of ‘fibrevores’.The majority of their diet should be made up of fresh, clean drinking water and good quality hay or grass specifically timothy grass hay. 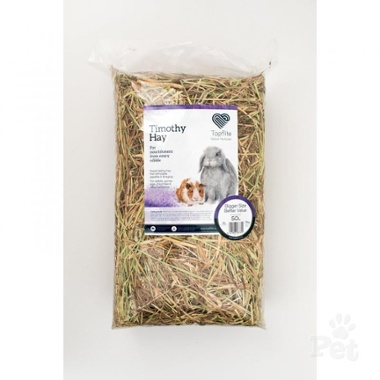 Healthy hays like timothy hay helps their digestive systems and provides the necessary fiber to help prevent health problems such as hair balls, diarrhoea, and obesity. Although other hays such as alfalfa hay should only be given to adult rabbits in small quantities, if at all, because of the high protein and calorie levels. In addition to hay, around about 10% of an adult rabbits diet should be made up of vegetables. Healthy options for small pets include consist of leafy, dark green vegetables such as romaine and leaf lettuces, parsley, coriander, broccoli (leaves and stem), bok choy, dandelion greens, and others. Variety is important, so feed your rabbit three different vegetables at a time. When introducing new veggies to a rabbit’s diet, try just one at a time and keep quantities limited. There are some veggies that you should avoid feeding such as iceberg lettuce as the high water content can lead to diarrhoea. As well as tomatoes, cabbage, corn, beans, peas, potatoes, beets, onions, rhubarb, bamboo, seeds, grains, and many others. If unsure check with your vet before feeding your pet a new fruit or veggie. While hay and vegetables are the basis of a healthy diet, rabbits also enjoy treats. Although many people believe the best treat for a rabbit is a carrot, carrots are a starchy vegetable with a lot of calcium so should be given as a treat in moderation. Other treats that your rabbit might love are apples (without stems or seeds), blueberries, papaya, strawberries, pears, peaches, plums, or melon. Extra-sugary fruits like bananas, grapes, and raisins are good too, but should be given on a more limited basis. There is also a range of store bought treats and chews suitable for rabbits, these are great as they draw on a rabbits naturally chewing instincts. 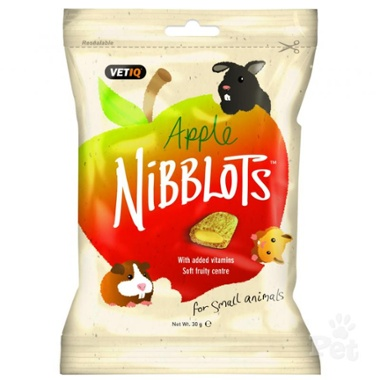 One great treat option is the Vet IQ Nibblots Apple Treat which is a crispy cereal treat with a cream filled fruity centre with added vitamins and Omega 3. Although treats should be given in moderation they can play an important role in encouraging interaction and building the bond with your furry friend. But be sure to never feed your rabbit any processed human foods as they will be unable to digest them so it will make them very ill. Although it can be possible to feed your rabbit without the use of pellets, this requires a careful balance of nutrient sources from many types of veggies and hay. So many rabbit owners prefer to offer some pelleted food in addition to hay and vegetables. 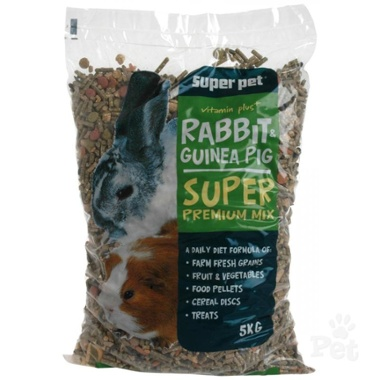 A pelleted food such as Masterpet Rabbit & Guinea Pig Premium Mix contains seeds, grains, extruded pellets, cereal discs and treats with added vitamins, minerals and trace elements for a balanced diet. Rabbits should always have a constant supply of fresh water available. The best way to offer water is to use a wall mounted sipper bottle as this avoids any contamination. If you do use a sipper bottle, watch your rabbits to make sure they know how to use the bottles. Otherwise you can use a heavy based ceramic bowl, it is important that these bowls are heavy so as to avoid your rabbit tipping it over when hopping around. No matter how you offer water to your rabbit it is important to clean and refill bowls and bottles at least once a day. Although rabbits are relatively clean animals, they will still need to have their hutches and sleeping areas cleaned on a regular basis. Each day, you’ll need to remove the wet spots from your rabbit’s bedding and clean up their litter area. Luckily enough rabbits are clean animals, so they will generally pick out just one or two areas of the hutch in which to go toilet. This makes it much easier to sweep the droppings out daily. You should also remove and replace all bedding from the enclosure on a weekly basis. If you live in an area where it is possible that your rabbit might have contact with a wild rabbit (while wandering your garden or nose to nose through its hutch), then vaccination is absolutely essential. In New Zealand Rabbits are vaccinated against calicivirus at 10 - 12 weeks of age and then every 12 months to maintain immunity throughout life. It is important to handle your rabbit frequently to help maintain a bond between the two of you. But remember that rabbits are fragile animals so they must be handled, due to their delicate bones, if they are not restrained properly and they struggle rabbits can break their own spines. To pick up a rabbit open the hutch door and let them come to you to be lifted out. Then place one hand under the front of the rabbit and the other offering a favourite treat or vegetable to help encourage them to approach you. Lift gently with both hands and hold them close to your body. It's important to remember to always support their hind legs while bringing them back up against your body. Be sure to never pick a rabbit up by its ears or by the scruff of its neck. And when you are ready to put a rabbit down always put it down gently, hind legs first, on a non-slip surface. But don’t forget that rabbits are prey animals so they may not enjoy being handled so be sure to be slow and gentle while getting to know your rabbit. Spaying and neutering is just as important for rabbits as it is for cats and dogs. After all the saying ‘breed like rabbits’ does ring true, so it is important to get your rabbit operated on to prevent any unwanted litters. But there are also health and behavioural benefits to neutering/spaying your rabbit. For male rabbits neutering helps to eliminates the risk of testicular cancer and can reduce aggression and territory-marking behaviours. Meanwhile for female rabbits spaying can reduce the risk of reproductive cancers which are very common in older female rabbits. It is also beneficial to their behaviour as altered rabbits are generally calmer and easier to manage. It is important to brush your rabbit regularly as rabbits lack the ability to vomit or cough up hairballs like cats. So you need to take any opportunity to brush them in order to remove excess fur and reduce the likeliness of illnesses such as gastrointestinal blockages. try to remove loose fur when you have the opportunity to do so. Simply petting or brushing your rabbit for a few minutes each day should remove most of the excess fur. Some rabbit breeds, such as angoras, have extra grooming needs because of their distinctive coats. Another vital part of rabbit grooming is keeping their toenails trimmed! It is good to check their nails weekly and take off a small amount at a time, as this is easier and more comfortable than having to cut a large amount off. Allowing your rabbits nails to become overgrown is not only uncomfortable for them, it can also cause both nail and foot injuries. Although some rabbits can live happily on their own, generally rabbits are social creatures so they are usually happier when in the company of a mate. Rabbits that are brought up together will usually get on with each other, but if introduced for the first time as adults they may fight. So it is important to do careful introductions when selecting a rabbit to ensure that they are compatible. Most animal shelters and rabbit rescue groups have pairs available for adoption. But if you already have a rabbit, you should consider adding another one to the family. Local rabbit groups can usually find a good match for your rabbit and help with the introduction and bonding process. Usually a good combination is a neutered male and a neutered female. But it is vital to understand that rabbits are not suitable companions for guinea pigs or other small pets, as they have strong hind legs that can injure a smaller pet. All rabbits need daily stimulation to maintain physical and mental well-being. Rabbits in the wild are extremely active running up to 5 kms a day, so it is important to give them as much exercise as possible to keep them healthy and happy. As a guideline it is recommended that rabbits need a minimum of 3 hours free-range time each day for them to run about, stretch their legs, and interact with each other and your family. A great way to play with your rabbit is to encourage them to practice their natural behaviour by providing safe things for them to chew such as toys or edible wooden chews. Although different rabbits enjoy different types of toys, so it is good to provide a range of types of toys and regularly rotate them out to prevent your rabbit from getting bored. It is also easy to make toys for your rabbit at home out of shredded paper, cardboard boxes or pipes and tubes. With proper care, feeding, and love, you can ensure your rabbit lives a long and happy life. As long as you make sure he or she has clean and appropriate places to sleep, healthy food eat, and time to bond with you and play. So be sure to read up and learn everything you need to enjoy a long and happy life with your delightful pet!